The supply of public transportation (other than by air) is an exempt supply in which no output tax will be charged. However, there is certain transportation services in Malaysia which are subject to Goods and Services Tax (GST) at standard rate. 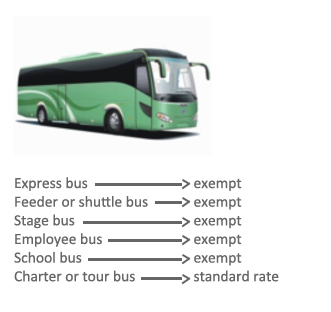 A bus company providing express bus service and tour bus service will need to charge GST of 6% on tour bus service whereas the supply of express bus service is an exempt supply. 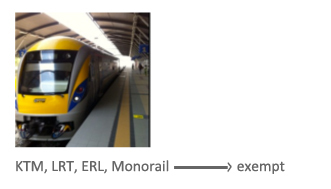 However, for those railway transports service for recreational or leisure purposes, such as railway service at zoo and park, are not regarded as public transportation and is subject to GST in Malaysia at standard rate. Similarly, the recreational or leisure cruise between ports in Malaysia and river cruise are taxable supply and subject to GST at standard rate. Therefore, passengers will be charged 6% GST on such services. Domestic flights in Malaysia are subject to GST at standard rate, including helicopter services. 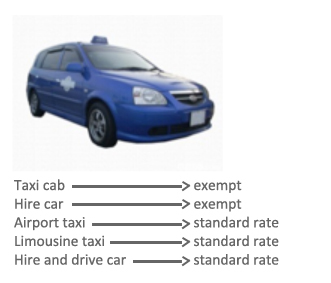 However, there are some exceptions on Malaysia GST treatment for domestic passenger transport service. If the services are provided within or between the designated areas (Langkawi, Labuan and Tioman), the supply of services will not be subjected to GST where the passengers do not need to pay GST on such transport services. The supply of international passenger transportation is zero-rated, where the transportation company who provides international transports will not be charging output tax to its customers and the input tax credit incurred is claimable. Even if a transportation service originates and ends outside Malaysia which passes through Malaysia, for example train service from Bangkok to Singapore, it is considered as international passenger transportation. The supply of passenger transportation from a place in Malaysia to another place in Malaysia can be formed as international passenger transportation and qualifies for zero-rated provided that these services are supplied by the same supplier. For instance, a flight from Sabah to London provided by same airline which the flight will transit at KLIA, the air fare is zero-rated. For require any further information regarding passenger transportation, please do not hestitate to contact us.